“Putting people first means reaffirming the cornerstone principles of the global drug control system, and the emphasis on the health and welfare of humankind that is the founding purpose of the international drug conventions,” the Executive Director of UNODC, Yury Fedotov, told delegates at the opening of the UN General Assembly special session on the world drug problem (UNGASS). The three-day session kicked off with the adoption by the 193-member body of the new framework on countering the world drug problem, drafted last month in Vienna by the Commission on Narcotic Drugs (CND), the UN’s top policy-making body on the issue. The document recognizes that to address and counter the world drug problem, appropriate emphasis should be placed on individuals, families, communities and society as a whole, with a view to promoting and protecting the health, safety and well-being of all humanity. “Putting people first means balanced approaches that are based on health and human rights, and promote the safety and security of all our societies. Putting people first means looking to the future, and recognizing that drug policies must most of all protect the potential of young people and foster their healthy styles of life and safe development,” he added. Mr. Fedotov further underlined that countries with limited resources and capacities to address the threats to peace, security, development and health posed by illicit drugs need to be assisted, including through support for alternative livelihoods, building accountable, effective judicial and law enforcement capacities to tackle supply, and enhancing prevention and treatment services. In his remarks to the Assembly, the UN Deputy Secretary-General, Jan Eliasson, recognized that some aspects of the drug agenda are sensitive and controversial. “I also know that some countries and regions have suffered more than others. It is therefore important that we listen to each other and learn from each other’s experiences, not least of how the well-being of people is affected,” he said. Looking forward to 2019, when the current Political Declaration and Plan of Action adopted by the Assembly’s first special session on drugs comes to an end, Mr. Eliasson said the global community should focus on new challenges and threats, including the emergence of new psychoactive substances. He noted that during the three-day special session, States will discuss the challenges associated with the world drug problem and how best to address them: “Because no society can claim to be completely free from the dire consequences that illicit drugs bring, or to have no relation to its many causes. 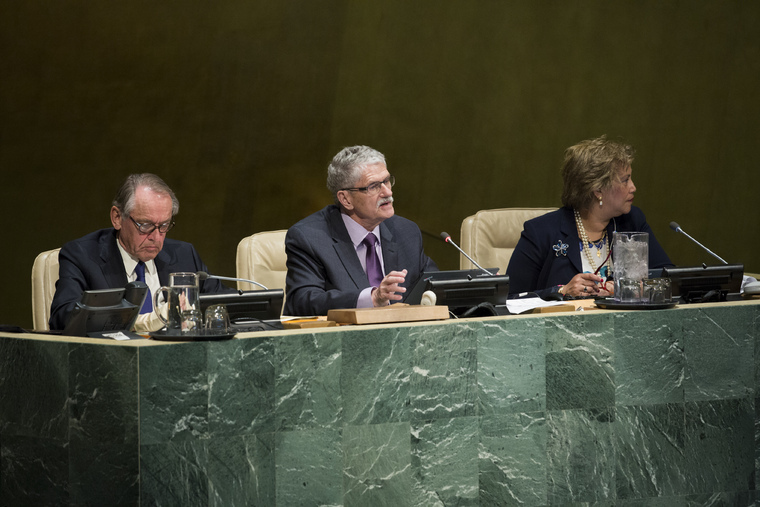 And no country can deny that addressing this problem is a common and shared responsibility,” Mr. Lykketoft stressed. 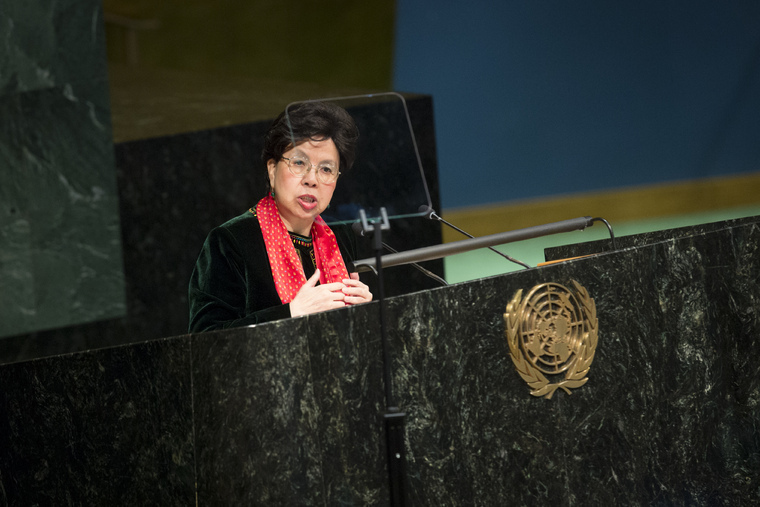 Taking the podium, Dr Margaret Chan, the Director-General of the UN World Health Organization (WHO), said an estimated 27 million people have drug use disorders, and more than 400,000 of them die each year. “The health and social harm caused by the illicit use of psychoactive drugs is enormous. This harm includes direct damage to the physical and mental health of users, drastically reducing the length and quality of their lives,” she warned. “In the view of WHO, drug policies that focus almost exclusively on use of the criminal justice system need to be broadened by embracing a public health approach. A public health approach starts with the science and the evidence. It tells us several things,” she added. Dr Chan said the evidence shows that drug use can be prevented, drug use disorders can be treated, drug dependence that contributes to crime can be diminished, and people with drug dependence can be helped and returned to productive roles in society. “WHO promotes a comprehensive package of interventions to achieve these objectives. The evidence shows they work,” she stressed, urging Member States to “remember the people” when they begin to implement the new framework.